The Austrian cannon is back in Washington Square Park. And some Italian Rochester history. In August 2015, in The WWI Austrian Cannon is back–or not–in Washington Square Park! and More on the Austrian Cannon Monument including from Rachel Barnhart we had fun with the appearing and disappearing of the Austrian cannon in Washington Square Park. 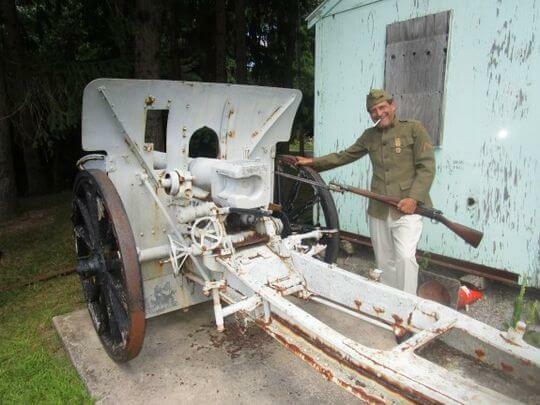 Back then, the Austrian cannon — captured by the Italian army in the last days of World War I and given as a gift to Rochester in 1921 by the Italian government — had been in storage for over a decade. Briefly, the cannon appeared in the park. Then, a couple of days later, the cannon was gone. Cannon during its short reappearance before disappearing. 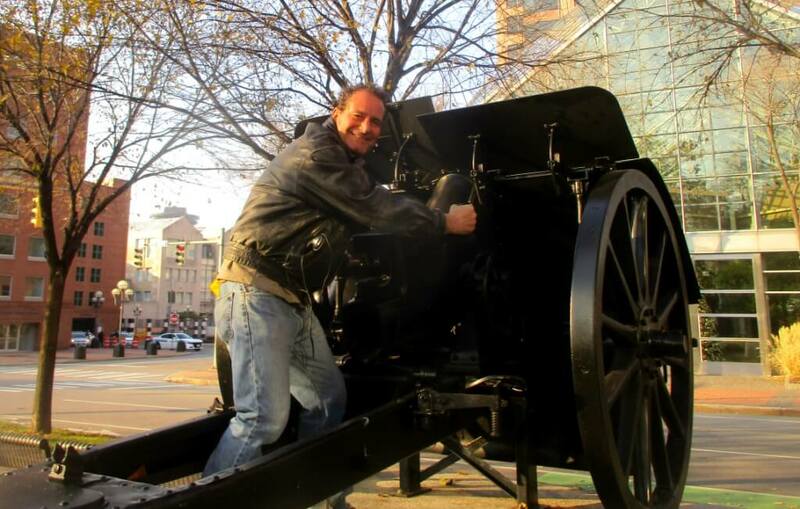 From The WWI Austrian Cannon is back–or not–in Washington Square Park! Base of Austrian cannon monument. From The WWI Austrian Cannon is back–or not–in Washington Square Park! Chuck explained that the cannon in need of repair had been kept in storage for many years. 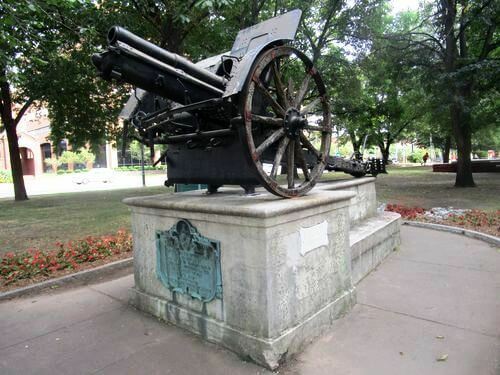 Seeking to rehabilitate the cannon, the City of Rochester replaced it on the monument to test its status. After that, Chuck offered his expertise to the City on how the cannon could be restored and whose expertise could be tapped. Although his Museum is entirely non-profit and charges no fees, Chuck explored a capital campaign to raise funds. The goal was to unveil the cannon for the anniversary of the United States Declaration of War in April 1917. 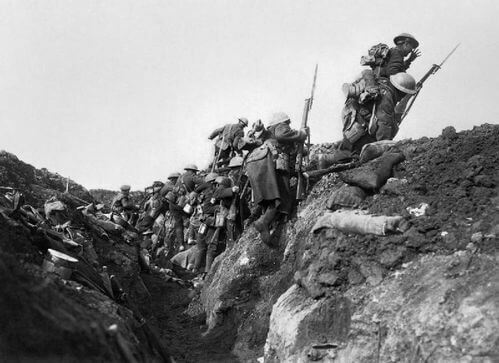 See One hundred years ago when America entered the War to End All Wars. And Rochester. 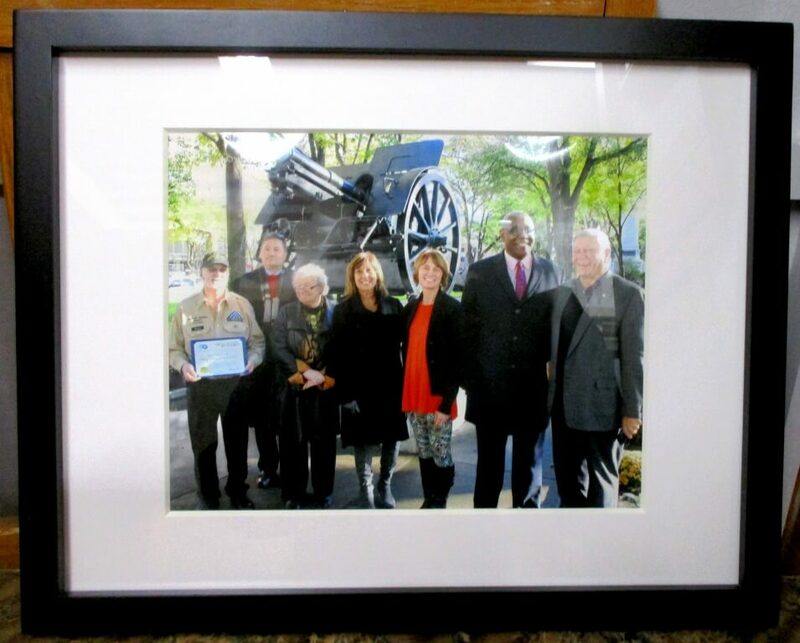 As seen in City Rededicates World War I Cannon in Washington Square Park, on November 9th, 2017 — with Veteran’s Day approaching — Rochester celebrated the return of the refurbished cannon due to hard work by the Parks and Recreation Department. Chuck received a well earned Distinguished Service Award for his invaluable help in making the restoration and the event possible. In addition, Mario Danielle has graciously offered financial support to enhance the look of the Monument, including American and Italian flags. Passero Associates has contributed the design which is planned for implementation in the spring. 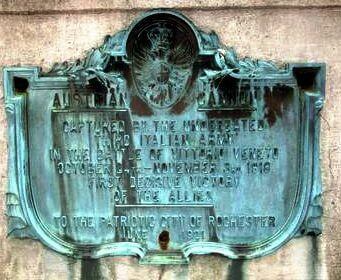 When looking at the plaque on the Monument describing the gift from Italy to the “Patriotic City of Rochester,” I wondered what the cannon and World War I meant to the Rochester Italian community about a hundred years ago. The most detailed source is Blake McKelvey’s “The Italians in Rochester: An Historical Review” (Rochester History, 1960). In his study that ends in the late 1950’s, KcKelvey paints a portrait of the first Italian immigrants from the 1860’s through the great wave of migration from the 1880’s into the early 1920’s. The Immigration Act of 1924 curtailed large scale Italian immigration. As described by McKelvey, the first Italians — like most immigrants especially non-English speakers — faced obstacles. Following the influx of the Irish, Germans and Jews, Italians, as the most recent group, were essentially on the bottom of the ethnic totem pole. Although only cursorily discussed by McKelvey, Italians were often considered to be modern day “snow birds” or guest workers. Upwards of 50% of the Italian immigrants would live back and forth between Rochester and the Home Country. As such, the Italian immigrants were often perceived as not “real” Americans. In 1919 and 1920, the Democrat and Chronicle ran stories about Italians who could not return home during World War I and afterwards went back by the thousands. By 1915, the Italian “colony” (in McKelvey’s term) had reached 15,000 native born inhabitants and 10,000 offspring — at which point Rochester was only surpassed by Trenton, NJ and Providence, RI in percentage of Italians in its population. For Italian Rochestarians who wanted to be seen as assimilated — as full citizens — the outbreak of the European War in 1914 would ultimately provide the opportunity for Italians to affirm their allegiance to Rochester and the United States. Before the United States entered the war, McKelvey says Italian men rushed to the defense of Italy. In May 1915, 2,000 Italians in the 12 county area indicated their readiness for military service. The first contingent of 61 men going overseas brought a roaring crowd to the Central Train Station on June 17th, 1915, reported approvingly by the Democrat and Chronicle. 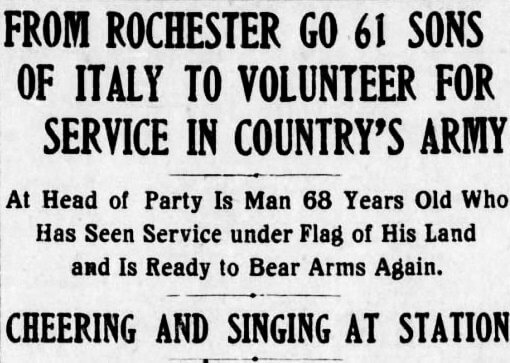 Eventually, 866 Rochesterians served in the Italian army. The pivotal event came in April 1917, when Congress declared war on Germany. Now, Rochester Italians could fight alongside their fellow Americans against the Central Powers. Literally and symbolically, the soldiers were no longer just serving Italy but serving the United States. About 2,000 Rochesterians joined the U.S. arm. 54 gave their lives, including John A. Sturla, a grandson of first pioneer Italian family. 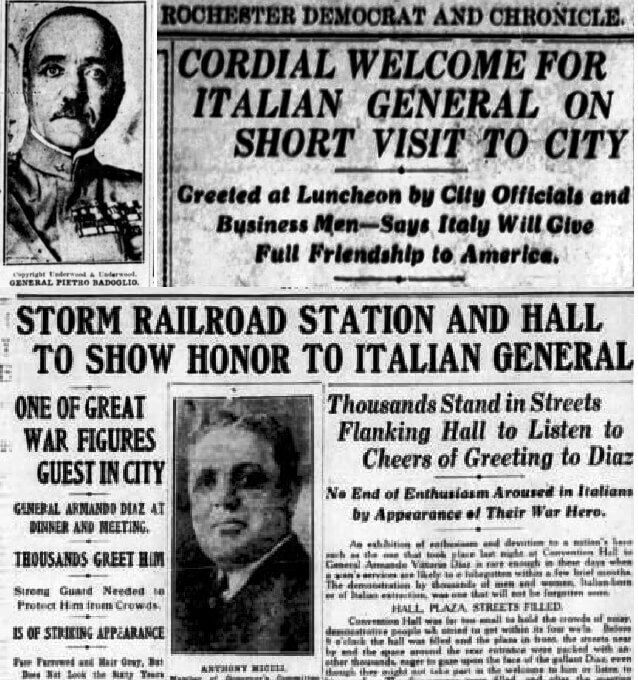 1921 featured the high point of celebrating Rochester Italians’ participation with the visit of two prominent generals and the Italian ambassador. 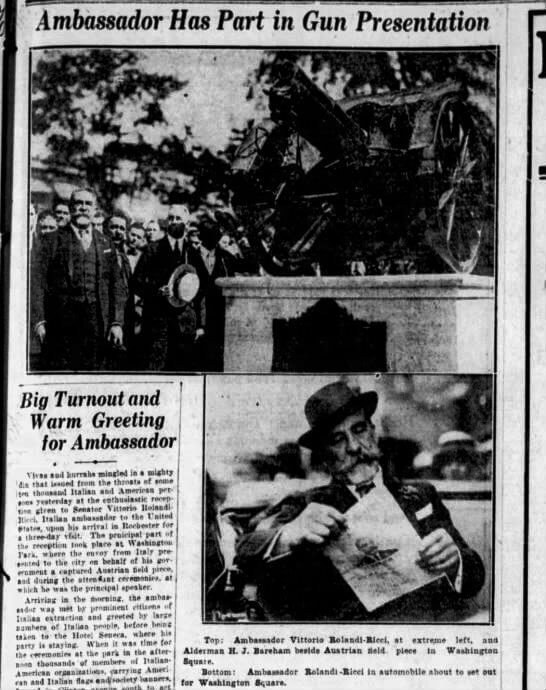 General Pietro Badaglio who led Italian troops in the Battle of Vittorio Veneto — in which the cannon in Washington Square Park was captured — made a short visit. Keeping in tone with his earlier coverage, the Democrat and Chronicle was effusive in its reporting of the reception of General Armando Diaz by thousands of Italian Rochestarians eager to reinforce their involvement in the war. Most importantly, the Italian Ambassador Senator Vittorio Rolando-Ricci visited for the presentation of the cannon and monument itself. The article describes the massive outpouring of Italians, particularly the Knights of Columbus, who turned out for the occasion. Ambassador Rolando-Ricci stayed for several days in Rochester. 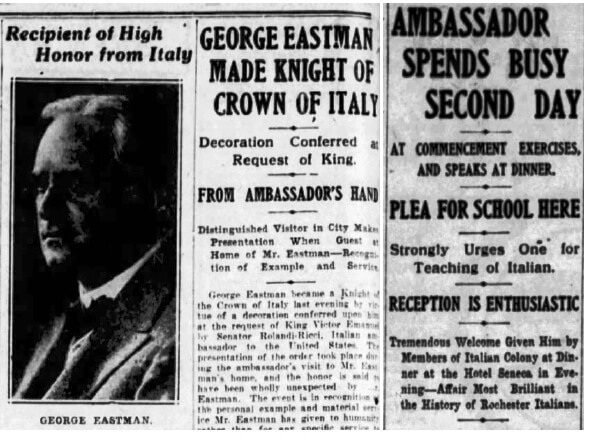 He made George Eastman a Knight of the Crown of Italy. 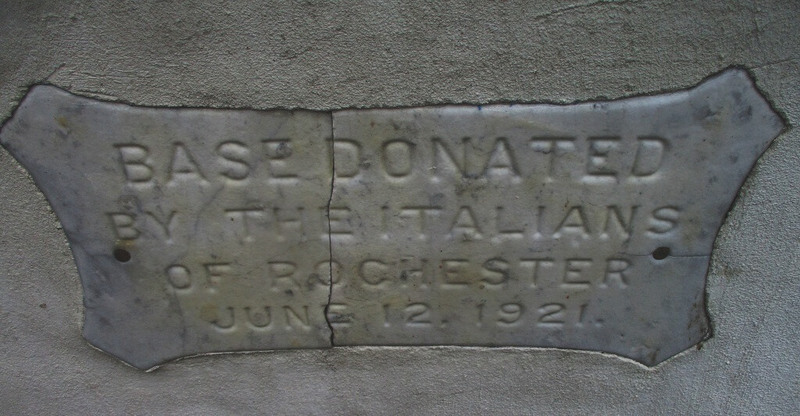 The Ambassador spoke at the University of Rochester Commencement and was given an honorary degree, the affair described as the “Most Brilliant in History of Rochester Italians.” Rolando-Ricci also urged for a school for the teaching of Italian, a call that might have rankled some who promoted assimilation of “hyphenated Americans” as the primary task at hand. 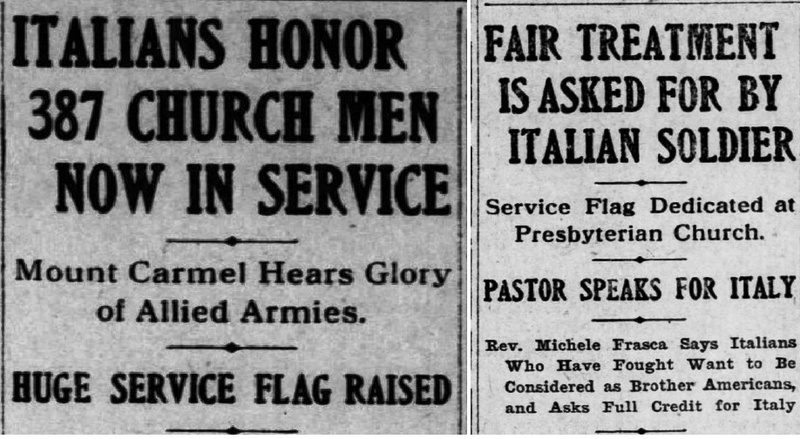 McKelvey’s claim that World War I proved to be a pivot point in the acceptance of Italians in Rochester society bears credence when compared to the enthusiastic embrace by the Democrat and Chronicle in its war related articles. The commemoration of war service can still be seen today in Edmund Lyons park in East Rochester, a town with a historically large population of Italian-Americans. In the park is a plaque honoring World War I veterans a howitzer captured from the German army. Edmund Lyons Park. 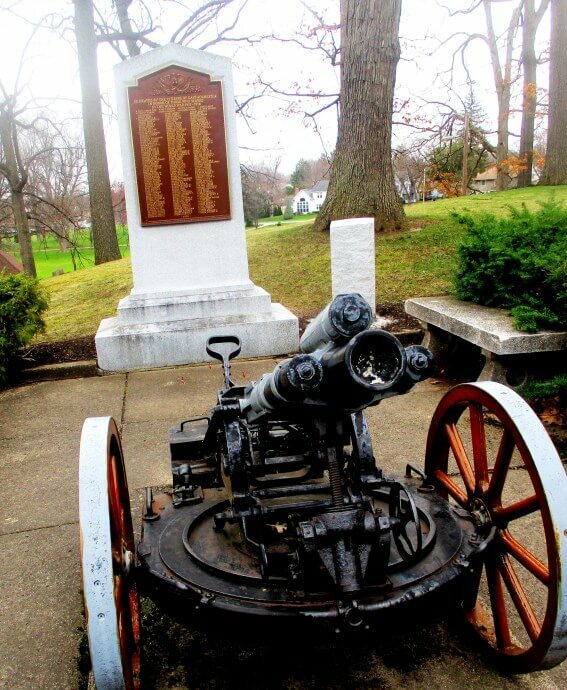 A captured German WWI minenwerfer and plaque dedicated to citizens of East Rochester who served in the World War. From One hundred years ago when America entered the War to End All Wars. And Rochester. When thinking of the return of the Austrian cannon, I have some mixed feelings. On one level, the cannon is a fitting symbol for the recognition of the contributions of Italian Rochestarians and a reminder of a time period when Italian-Americans faced ethnic and religious discrimination. On the base of the monument in Washington Square Park. On another level, I have a personal connection to the cannon. When my father brought us downtown, as an imaginative boy, I pretended to be those Austrian artillerists at the battle of Vittorio Veneto: in the last days before the November 1918 Armistice futilely lobbing shells at the surging Third Italian Army against a backdrop of snowy Alps as the Hapsburg Empire receded into history. A few years later, I could envision myself as a tragic/heroic character from Hemingway’s A Farewell to Arms reveling in the supposed romance of war. Then, as a boy, I took thrilled joy in imagining the cannon blowing holes into lines of advancing men. Today, as a man, I see senseless carnage and mourning mothers. Did the the bloody battle of Vittorio Veneto even had to be as it the Austrian cause was lost and armistice was only a few days away? In addition to the worthiness of the cannon for its significance in the history of Rochester, maybe we could include a companion text next to the monument. 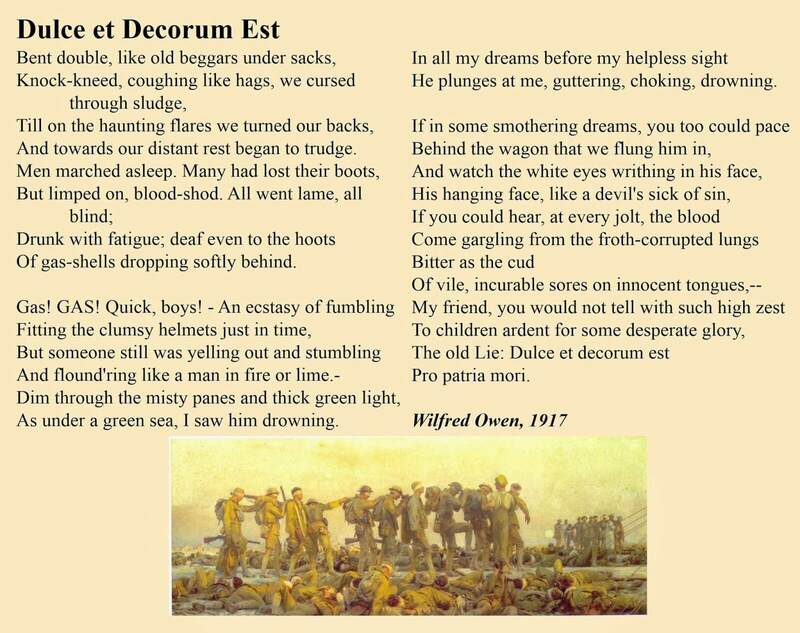 I nominate Wilfred Owens’ “Dulce et Decorum Est,” lest we never forget the horror of war. One hundred years ago when America entered the War to End All Wars. And Rochester. 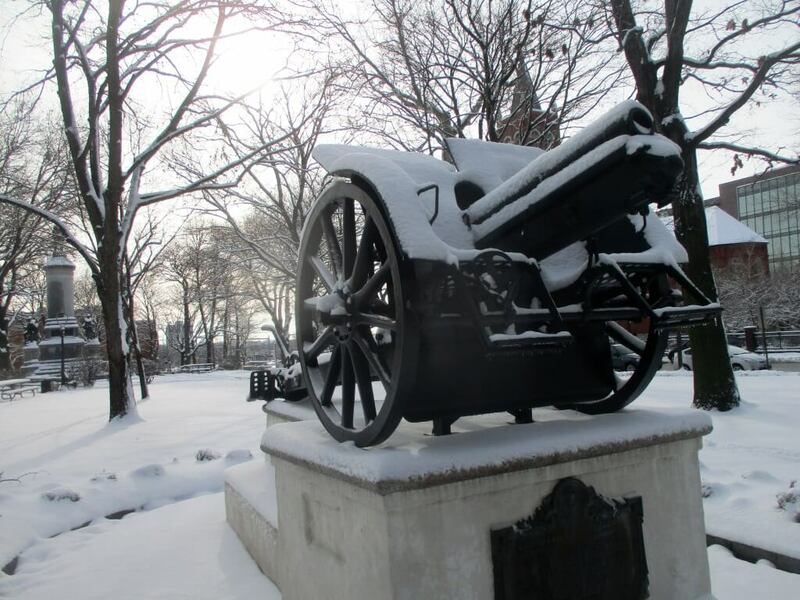 The WWI Austrian Cannon is back–or not–in Washington Square Park!